Is Formaldehyde in your wood flooring? Beleaguered flooring retailer Lumber Liquidators is paying $2.5 million to settle allegations that some of its products violated California’s air-safety standards. The penalty announced Tuesday was the latest that Lumber Liquidators has absorbed for formerly selling laminate flooring made in China. In this case, Lumber Liquidators faced allegations that the imported flooring contained high levels of the carcinogen formaldehyde that violated California’s air-quality controls. The flooring was sold at Lumber Liquidators’ California stores from September 2013 until May 2015 when the retailer suspended sales of the products made in China. 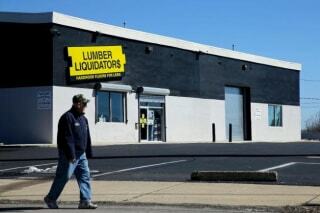 Lumber Liquidators currently operates 40 of its 375 stores in California. The Toano, Virginia, company didn’t acknowledge any wrongdoing in the settlement with the California Air Resources Board. Last year, Lumber Liquidators paid $13.2 million in fines and pleaded guilty to environmental crimes for importing China-made flooring that contained timber illegally logged in eastern Russia. Lumber Liquidators still faces a variety of class-action lawsuits revolving around the formaldehyde levels of the China-made flooring. The legal fallout so far has been less costly to Lumber Liquidators than the damage done to its stock since investigation shown slightly more than a year ago “60 Minutes” raised questions about whether the retailer was selling potentially hazardous flooring. Shares of Lumber Liquidators Holdings Inc. have plunged more than 70 percent since the TV program aired, a downturn that has wiped out more than $1 billion in stockholder wealth. The shares rallied Tuesday, gaining $1.74 to $13.76 in afternoon trading. Formaldehyde is a colorless, flammable, strong-smelling chemical that is used in building materials and to produce many household products. It is used in pressed-wood products, such as particleboard, plywood, and fiberboard; glues and adhesives; permanent-press fabrics; paper product coatings; and certain insulation materials. In addition, formaldehyde is commonly used as an industrial fungicide, germicide, and disinfectant, and as a preservative in mortuaries and medical laboratories. Formaldehyde also occurs naturally in the environment. It is produced in small amounts by most living organisms as part of normal metabolic processes. 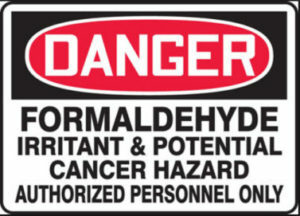 How is the general population exposed to formaldehyde? According to a 1997 report by the U.S. Consumer Product Safety Commission, formaldehyde is normally present in both indoor and outdoor air at low levels, usually less than 0.03 parts of formaldehyde per million parts of air (ppm). Materials containing formaldehyde can release formaldehyde gas or vapor into the air. One source of formaldehyde exposure in the air is automobile tailpipe emissions. During the 1970s, urea-formaldehyde foam insulation (UFFI) was used in many homes. However, few homes are now insulated with UFFI. Homes in which UFFI was installed many years ago are not likely to have high formaldehyde levels now. Pressed-wood products containing formaldehyde resins are often a significant source of formaldehyde in homes. Other potential indoor sources of formaldehyde include cigarette smoke and the use of unvented fuel-burning appliances, such as gas stoves, wood-burning stoves, and kerosene heaters. Industrial workers who produce formaldehyde or formaldehyde-containing products, laboratory technicians, certain health care professionals, and mortuary employees may be exposed to higher levels of formaldehyde than the general public. Exposure occurs primarily by inhaling formaldehyde gas or vapor from the air or by absorbing liquids containing formaldehyde through the skin.